I like to make a gift for my kids each Christmas. However, this year, The Joe beat me to the punch and already filled our "handmade"category. I'm really excited about that, but I was hoping to make monsters for the kidlets. I decided I could rationalize the monsters if I turned them into stockings. I bought some felt like fabric and traced an old stocking and added an inch to get the shape. You think a stocking shape would be fairly simple, but I've blown it enough times to know that I need a pattern. I always make them way too skinny minnie. I also made the top much taller so I could fold it over. I bought a package of different colored felt and had a lot of fun designing the little guys. My kids are really excited about it, so I made a bunch of monster pieces with the left over scraps and they are enjoying putting different monsters together. It made me wonder if monster kits would be a good idea for a future gift. I stitched each piece on with embroidery thread and then folded the top down and sewed each side before putting the two sides together. It's fun to come up with all sorts of different creatures. Or facial hair. Let your kids help decide! This mustache was initially intended for hair, but Liv suggested turning it into a mustache! I love it! Monster glasses are fun too! Hopefully not too scary for Santa! Do you like making your own stockings or do you prefer to buy them? Do you like to have them match, or all different? I always had a crocheted stocking from my mom that I loved, so it just feels more like Christmas to me with a bit of handmade lovin. I also wanted to thank everyone for entering the Wreath and Sign contest on Friday! What creative ideas you have!!! The contest was a bit self-serving, I wanted to have some fresh new ideas for wreaths and you all pulled through and now I have an awesome "want-to-do" list. Thanks so much for being so talented and willing to share your ideas! She knocked my socks of with her Rosette Wreath made with leaves! 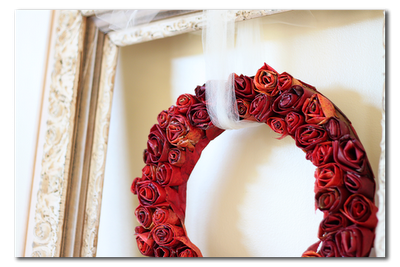 Stunning, incredible creative and inexpensive! 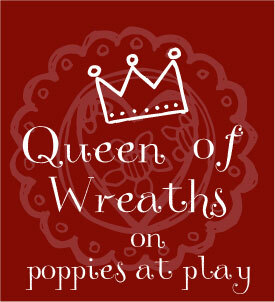 Your dubbed the queen of wreaths by Poppies at Play! Our next contest, should you want to enter, is on Friday 1oth! I know you have some great ideas brewing! Share the wealth! Thanks so much!! I'm floored by the win! And love those little monsters - way cute! Oh my goodness, those monster stockings are ADORABLE!!! I host a Thursday linky party called Thrilling Thursday @ Paisley Passions. If you have time, I would LOVE for you to link these up this week. Super cute! Those are so fun! When I have kids I am totally going to use this idea!